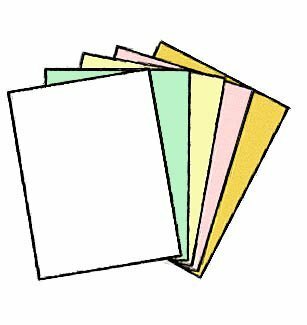 This is a 5-part NCR Paper* Brand paper set, (5930) CF (Coated Front) Goldenrod, CFB (Coated Front and Back) Pink, CFB Canary, CFB Green, CB (Coated Back) White Precollated RS (Reverse Sequence). Produced by Appleton, NCR Paper* Brand paper has set the standard for the highest quality carbonless paper. NCR PAPER. Why use expensive pre-printed NCR forms, when you can print them with your laser/inkjet printer? This is a 500 sheet ream of 5 part NCR standard weight, letter size paper, with carbonless NCR features. Sheets feed individually through the laser printer, then can be used like any other NCR form. Buy a full case of 10 reams and save even more!! Product Uses - Contracts, Delivery Forms, Employment Applications, Insurance Forms, Invoices, Legal Forms, Medical Forms, Multi-Part Forms, Office use, Proposals, Purchase Orders, Quotes, Requisition Forms, Sales Receipts, Tracking Manifests. And More. Printer Compatibility - Inkjet Printers, Offset Printing. View More In Carbonless Copy Paper. If you have any questions about this product by Limited Papers®, contact us by completing and submitting the form below. If you are looking for a specif part number, please include it with your message.